As it flew past Pluto on July 14, New Horizons stored tens of gigabits of data on its digital recorders. The first images and other data sent back during the flyby were only 5 percent of what the spacecraft actually obtained; the remaining 95 percent would start to be sent back several weeks later. While New Horizons didn’t enter orbit around Pluto, it was still able to collect an enormous amount of data during the flyby, which will take months to send back to Earth, and many years to analyze. Pluto is so far away – more than 3 billion miles – that even at the speed of light, it takes the radio signals 4.5 hours to reach Earth. Since late-July, New Horizons had only been sending back lower data-rate information collected by the energetic particle, solar wind and space dust instruments. But now, the spacecraft will resume sending back flyby images and other data. The massive downlink of new data began over the Labour Day weekend, showing the surface at resolutions as good as 400 metres (440 yards) per pixel. “The New Horizons mission has required patience for many years, but from the small amount of data we saw around the Pluto flyby, we know the results to come will be well worth the wait,” said Hal Weaver, New Horizons project scientist from the Johns Hopkins University Applied Physics Laboratory (APL) in Laurel, Md. For the public in general, the most exciting data to be sent back are the images – closeup views of a world never seen before in detail until now. 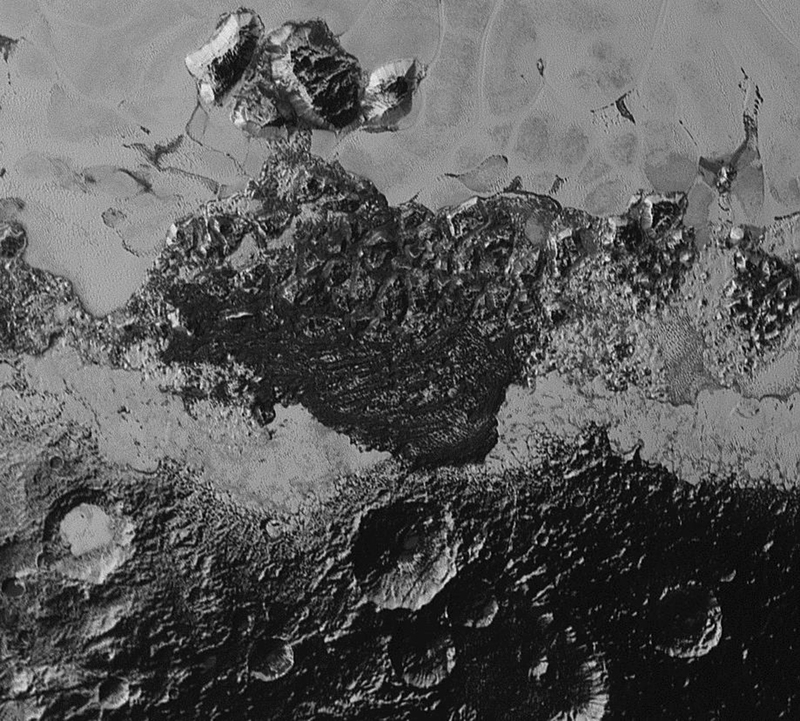 Today, the newest images have been published on the New Horizons website, and they are indeed beautiful. 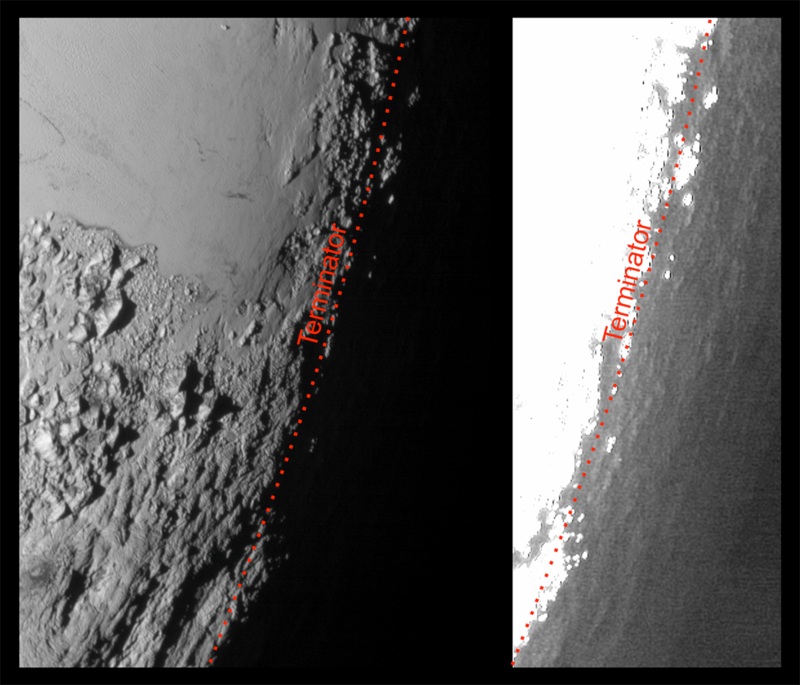 These are unprocessed pictures from the Long Range Reconnaissance Imager (LORRI) instrument on New Horizons. 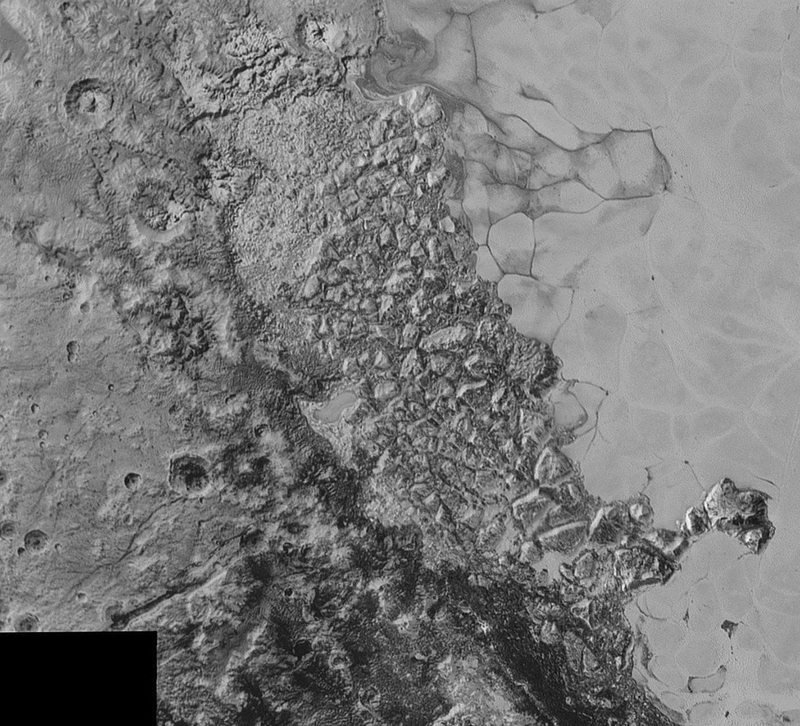 The entire collection is here, while the most interesting science ones, showing Pluto’s varied terrain, etc., are here. New images will now be posted to the website each Friday, starting tomorrow, Sept. 11. The new images show an amazing variety of complex terrain on Pluto, astonishing for such a small, cold world so far from the Sun. 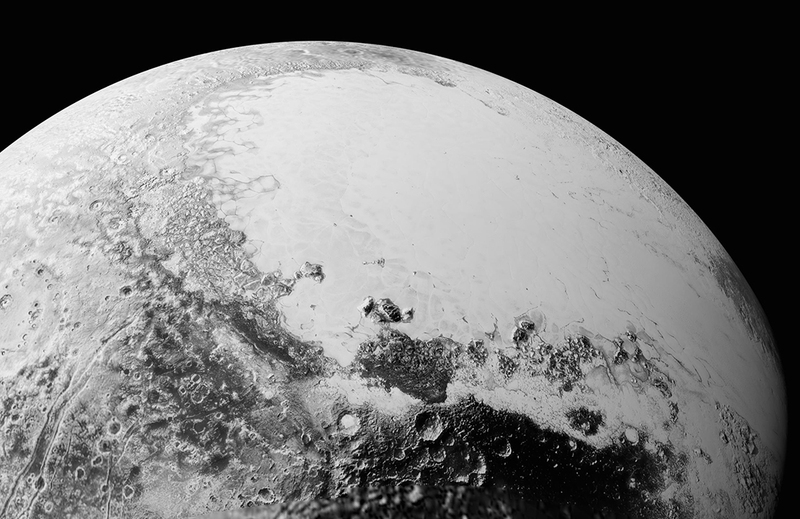 The images show Pluto to be a geologically active world, more so than had been thought possible not that long ago. The large icy plains of frozen nitrogen stand in stark contrast to the rugged mountains and older cratered terrain. The nitrogen ice appears to slowly flow across the surface, similar to glaciers on Earth. There are also interesting networks of valleys and there might even be fields of dark sand dunes, surprising for a world with such a thin atmosphere. The regions of chaotic-looking, jumbled mountains are similar to what has been seen on Jupiter’s moon Europa. 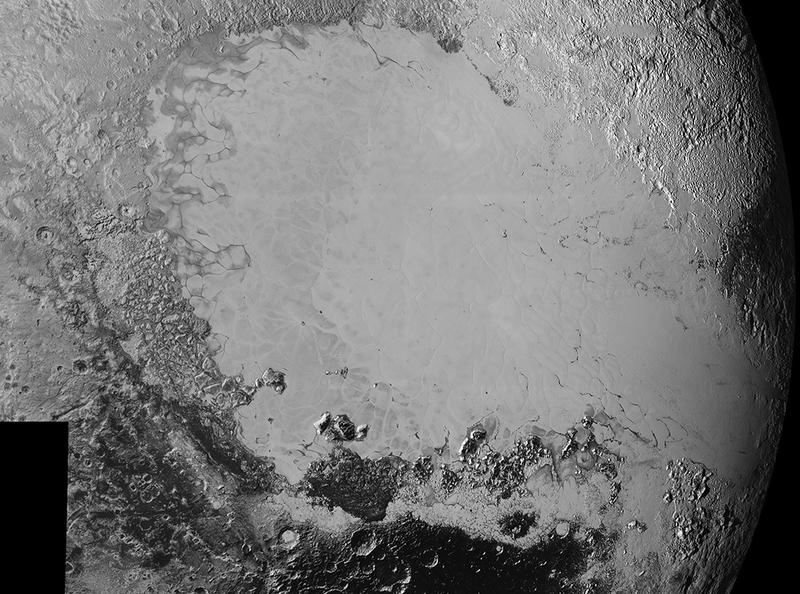 The images of Pluto returned so far also show that Pluto’s thin atmosphere contains many layers, which create a beautiful twilight effect that softly illuminates the night side terrain near sunset. 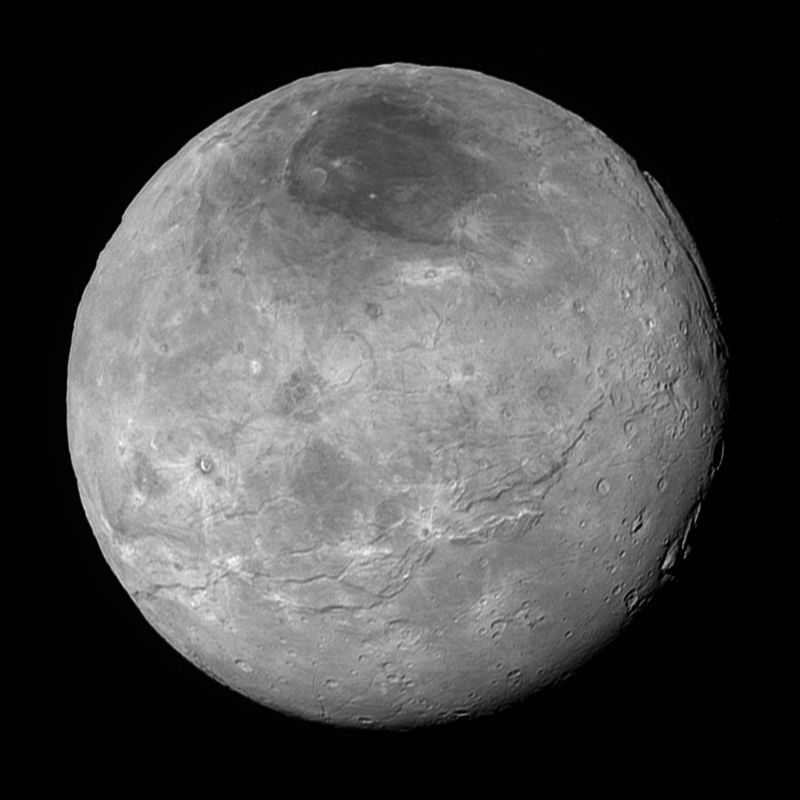 There is also a new higher-resolution version of the previously released image of Pluto’s largest moon Charon, showing in greater detail that this moon also has a complex geological history including tectonic fractures, smooth plains and mountains, as well as an unusual dark region at the north pole. This region is much redder in color than other terrain on the moon. Scientists are interested in what is causing that colour difference. The main theory right now is that small amounts of Pluto’s atmosphere can be “shared” with Charon where it could become trapped at the very cold poles, between -258 and -213 °C (-433 and -351 °F) in winter. The reddish material is thought to be the same as what is found in Pluto’s atmosphere – nitrogen, methane, and carbon dioxide. 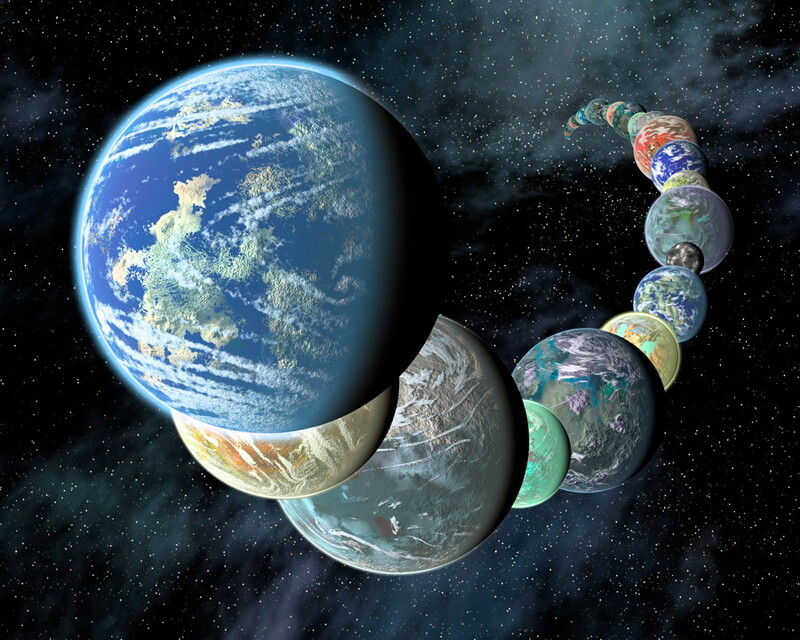 When the pole moves back into warmer sunshine later, the ices would sublimate away, but the solar radiation would also create a new substance from them called a tholin, which would explain the reddish colouring. Better images of some of Pluto’s smaller moons, Nix and Hydra, will also be released tomorrow. New Horizons is now heading toward its next target, a much smaller object in the Kuiper Belt called 2014 MU69, which is about a billion miles past Pluto. If all goes well, New Horizons is expected to reach 2014 MU69 on Jan. 1, 2019. New Horizons is currently more than 5 billion kilometres (3 billion miles) from Earth, and more than 69 million kilometres (43 million miles) beyond Pluto. More information about the mission is available here and here.